Today, in a comment attached to an earlier thread, John Gallaher noted a new article in Atlantic magazine about Irish debt resolution challenges. The article is written in a popular style and may overstate some points, but it includes an interesting comparison graph of Irish mortgage arrears with mortgage arrears in other troubled European nations. The graph (the first one in the article) is entitled Late Stage Mortgage Arrears in European Countries. The Irish Minister of Finance, Michael Noonan, is on record in the Dail stating that the claim that there is any strategic mortgage arrears in Ireland is wholly anecdotal and not based on any in-depth analysis. Can anyone explain this graph without acknowledging some element of strategic behaviour by Irish mortgage holders? If you want to comment on the Atlantic article, please do so on their comments page so that the article’s author can read them. I just want someone to explain the graph to me, not discuss the article. There is no doubt that strategic arrears by the debtors is occurring… but the question is to what level? The more pertinent question though – from that graph is how did the banks allow the arrears to balloon so incredibly? How do the Irish banks manage to get so many 180-day+ mortgage arrears without them first appearing in the sub-90 or 90-180 day categories? There’s a bit of strategic something going on wholesale – but it’s not by the borrowers! Do the banks have enough Honohan capital stuffing ? Isn’t that the biggest question ? Say 100,000 loans are restructured and the mortgage holders start 7 years of financial purgatory- what will that do to the graph? Have to say too that the attitude of the teaching unions does not bode well for the dislocations that are coming. I couldn’t believe what I was living. The last paragraph of the article states what should be done .The probability that it will be done is nil. The problems are not going to go away ,they will be back. Retrospective non-recourse defaults, for the win! I meant to add: The Irish banks and indeed the government have lost their moral authority to implement mass evictions. This is not a question of legislation, it is a basic question of legitimacy. Jail the top ~100 or so bankers, hold a full and complete inquiry, and engage in a mass reformation of Irish corporate law, and you’ll be able to evict half the country without too much hassle. But continue to do nothing, reward criminal activity in the banks and elsewhere, and hoist the debts of buy-to-lets on the rest of us and you’ll be in a lot of trouble come eviction day. Q. What is the incentive for a hopelessly insolvent borrower to service or part service an unsustainable mortgage on a property deep in negative equity? A. There is no incentive. Perhaps mortgage arrears are so high because we have very high rates of home-ownership amnd property investment and, following on from one of the worst property bubbles in world history, many people are hopelessly insolvent, deep in negative equity and have no functioning insolvency regime available to them?? To be honest, the idea that borrowers would stick it to the banks by engaging in mass witholding of payments appeals to me somewhat. I just don’t think it is a large contributor to the problem for principal private residence loans. I expect there is an element of strategic default for buy to let mortgages where people are acting for commercial motives and therefore are more likely to behave strategically and accordingl to incentives. I would tend to agree with Zhou. Primary residence mortgages underwater are probably less likely to have the strategic angle. BTLs are another kettle of metaphors. @Zhou En Lai — It is a matter of definition of strategic arrears vs. distressed arrears which can be tricky and greatly affects the estimated ratio. All of the reasons for not paying mentioned in your comment involve active choices by mortgage holders based on their incentives. So they would all qualify as strategic arrears in my thinking. I agree that politically-motivated strategic arrears would be small part of arrears but that is just a tiny fraction of strategic arrears. Distressed arrears is “can’t pay” as opposed to “won’t pay.” Admittedly that is far from a tight definition since those terms in turn need to be clearly defined. @seafoid — Paying for a fancy wedding by building up mortgage arrears would qualify as strategic arrears IMHO, but perhaps that is me being harsh. To be fair to the government, I think that is one of the main reasons for putting together the much publicised and maligned ‘guidelines’ leaked to the press over the past week. Essentially, these guidelines suggest you should contribute all of your after tax income to paying off your mortgage save for a basic level of income needed to live a (very) frugal lifestyle. If that excess income is enough to cover your mortgage payments and you are currently in arrears, then by definition you are a strategic defaulter. I don’t suppose the guidelines are intended to be taken so literally (I could be wrong here) that your bank manager will be telling you to quit smoking or to hold off on a bet on the grand national. With the new target set by the central bank to have 50% of arrears cases resolved (however that might be defined) by the end of year, we will have a better understanding of strategic default levels quite soon. My guess is that strategic defaults are much more common in the BTL space than in owner occupier homes. BTL forclosures are also much less controversial, so I expect we will see hundreds, if not thousands, of these appearing over the next couple of years. Allsop auctioneers will be busy! If we had a functional insolvency regime like in the USA or in the UK then the arrears figures would be less. The implication in the Atlantic article and elsewhere that we might have some kind of national character flaw that a huge portion of the population don’t bother paying their lawful debts offends me gravely. Similarly, the canard about the legal impediments to reposessions also offends me as it is clear from the stats that it is not the main cause for a lack of reposessions. We certainly do suffer from a lack of legislative competence as demonstrated by the regulatory capture of the Departments of Finance and Justice by the banks in drawing up the new personal insolvency regime. That criticism cannot be denied. 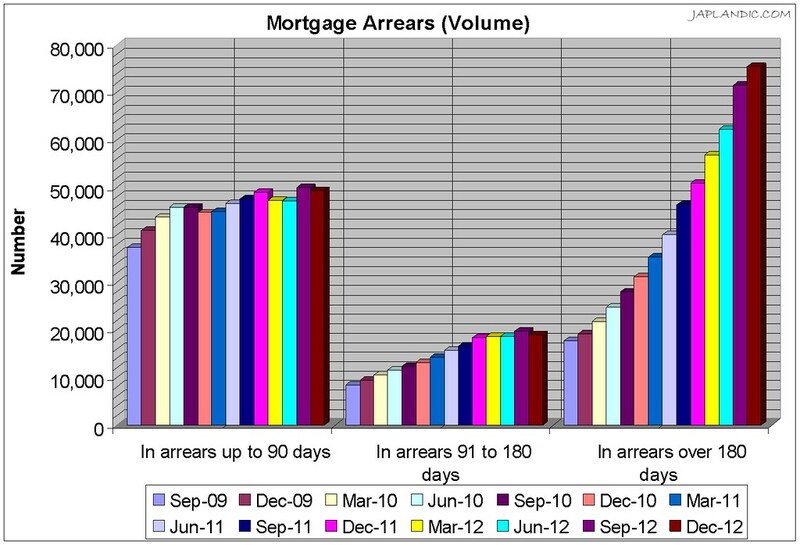 Can anyone explain this graph without acknowledging some element of strategic behaviour by Irish mortgage holders? Let me be Irish for a moment and answer a question with a question. How do you account for the fact that there are no spikes in the sub-90 and 90-180 day arrears categories but the 180-day+ category continuously rises? Are these strategic defaulters somehow managing to fly under the radar of the banks for 6 months of the year and then suddenly pop up as “Late Stage Mortgage Arrears”? Surely if they were strategic defaulting (and it was an en masse thing) then they would appear like a sine wave moving through the various stages of default? Like I say, something strategic IS going on wholesale – but it’s not by the borrowers! I broadly agree with OMF, it’s a legitimacy crisis.. I think it’s under appreciated. Though hardly unexpected, citizens have watched banks and politicians bring the state finances to the brink, then over the brink, now back near the brink and the justice vacum that has followed has only been punctuated by stories of rewards for the criminals involved, at the victims/citizens expense. Then you have stories of those resourceful enough filing for Bankruptcy in countries with proper bankruptcy regimes. So that is essentially saying to a people, right and wrong doesn’t matter here, what matters is what you can get away with in your self interest, that’s what matters in Ireland. Citizens are also broadly aware of the politicising of this issue. So perhaps there’s some self profiling going on. eg A young family isn’t going to be thrown out on the street. Also people are aware of the general incompetence of the state. Perhaps some are waiting to see if this time it could benefit them. As in, holding out for ‘Mortgage forgiveness’ from those that supported ‘The Gaurantee’. The legitimacy crisis is causing ‘a mortgage run’. Gregory given that tracker rates are currently 2% and under, and that most holders of trackers are now facing lower rates than they agreed to back in 2004-2007, while variable rates have risen, one would expect more distress amongst holders of variable rate mortgages, cet. par. and given the vintage. In the medium term tracker rates will rise more than variables, triggering more distress. I can find no data which breaks out incidence of arrears into trackers vs variables. Can anyone point me towards numbers if they exist? @Seafoid, Zhou En Lai ans What Goes Up — I enjoyed looking at the link that seafoid provided (not sure that doing so qualifies as academic work since I am at work at the moment!). The future brides of Ireland seem virtually 100% opposed to people engaging in strategic arrears and then getting debt forgiveness, which is an encouraging finding. Zhou En Lai, what stats are you referring to here: “Similarly, the canard about the legal impediments to reposessions also offends me as it is clear from the stats that it is not the main cause for a lack of reposessions.” What Goes Up, I cannot follow those Japlandic graphs and having trouble integrating (summing) 90 day arrears to make them 180+ arrears — note that the graphs are in amounts rather than number of cases so the amounts will tend to jump up for a fixed number of cases. I cannot decompose the graphs and would prefer a Central Bank reference for these figures. I have a report due tomorrow so must bow out but thanks for the comments. Having posted my comment, I see that many of the points have been addressed by zhou enlai and Prof. Connor. I assure you those comments were not there when I began writing my post. I wonder about those figures too. Could they include restructured mortgages which fell back into arrears after the restructure ended? I thought it was interesting too. Most of the ladies appear opposed to shameless behaviour such as not paying their mortgages even if deep in NE. Isn’t 2013 going to be the year of the repo anyway? Won’t we discover a lot when the tide goes out ? Are there any stats on mortgages belonging to people who have emigrated ? By way of an aside, Justice Hogan was previous previously Gerard Hogan, Senior Counsel, who has been referenced a number of times on this blog as one of the country’s leading jurists. 1. people fall out of the 0-90 and 90-180 day “buckets” over time, no matter what happens (ie they either get back to current, or simply graduate to the next bucket). But the only way to migrate out of the 180+ is to get back to current. 2. the longer u are in arrears, the more difficult it is to get back to current, given rolling up of past due payments? So lots of people might get into 0-90 days arrears but manage to get out before it gets really bad, but once ur in 180+ you’re kinda toast? There is some insight in Table 4 from this CB paper (though the data are from December 2010). There is also a table, though with less detail in this paper. Again it is table 4 and again the data is from December 2010. They both show higher arrears in SVR mortgages over tracker mortgages and the much higher balances on tracker mortgages means the potential problems from higher interest rates is greater. Somebody is looking through the wrong side of the lens. So is the Public Sector pay bill, OMF. The money is not there. And the political model appears to be broken. Did you ever see that Trevor Griffiths play about the French Revolution “Who shall be happy”? Rent seeking appears to be the default position. The weak end up shafted because they represent the path of least resistance. @Sc ta for the links-higher meaning as a % of all SVR ? This has some good data too,specifically with IO….again dated. Aye – but to get to 180-day+ you need to go “<90d”, then, if you continue to stay in arrears, next quarter you go “90d-to-180d” and then the next quarter you appear as “180d+” – so you should see this pattern in the graphs. I’ve done a couple of graphs for Gregory, using both mortgage numbers and mortgage values. Neither show this pattern. You can have people go “<90d” and recover. You can have people go “<90d”, progress to “90d-to-180d” and recover. You could even have people go “180d+” and recover. But for the “180d+” to have the trajectory it does – without correlation in the preceding quarters is simply a sign that the banks have been pushing “Interest only”, payment holidays and rolled-up loans as “solutions” to those it should have been actively managing – using hope as a strategy. When it becomes evident that the “solutions” are simply exacerbating the situation the banks have been simply dumping people into the “180d+” category – and writing them off. The original graph Gregory Connor is using as a glaring indicator of some strategic default is really a huge indictment of a failure of basic loan management in the banks. There were crap at banking before September 2008… and they’ve somehow managed to get worse at it! Seamus Coffey – thanks, the Kelly paper indeed shows that trackers (for the time period stated) performed better, which is not surprising. But if the policy rate, say in 2015 or 2016, goes back to 3%, tracker rates will more than double, while variable rates might not rise at all (or should not rise at all!). My worry is that the trackers will then start to default like variables. Interest rates have the potential to stay low for a while. They seem to say things are really banjaxed. There is no sign of deleveraging coming to a halt. It is the mother of economic adjustments. Of course there may be inflation but would you bet on it? Given the scenario you present as having a slightly more than 50/50 chance of being the actual outcome (in my opinion) surely there will come a time when the Regulator/CBI will have to be told to agree to a lower Tier I Ratio level for the affected banks, as the numbers could go way beyond that modelled in the 2011 PCAR exercise? If not then it would seem politically suicidal to ask (again) the citizens to refill the ratio bucket for the 3rd/4th time ?? – I’ve lost count. Surely easier to simply change the rule or seek a derogation from the European Banking Regulator. It’s easiest so, to simply do nothing. Nothing until someone or something else forces you to do the absolute minimum possible. Meanwhile the developers, bankers and other “Men of Quality” head off for a quick bankruptcy in Tir na nOg or the like, living life in bliss and careful never to let their feet touch common soil in Eire. Unfortunately, they’re the ones who’ll get sagas written about them. Absolutely – except they obviously are using the period of restructuring as a mask to jump people from 0 to “180day+” in one single bound. It’s a lot easier to go back with the begging bowl when you have so many people hopelessly screwed (but not harshly treated) on your books, than trying to make a case for more money whilst appearing to be the big bad wolf, huffing and puffing the little piggies out of their homes. @What Goes Up — I have looked at the figures on the Central Bank spreadsheet that you sent me — thanks for that. I think that you are making an analytical error in your description of the dynamic growth the categories. These are amounts in arrears and the +180 days amounts figure is almost certain to increase strongly quarter-by-quarter in the absence of cure (which is roughly the current situation). You might be confusing amount in arrears with number of accounts in arrears. When I look through the various columns and do some rough checks they all seem to be consistent. There is an even flow of amounts through the other categories (which neither increase nor decrease as long as the flow of new cases is constant) and the +180 days category increases strongly. The statistical dynamics are interesting (there is a good phd dissertation chapter in analyzing them in terms of a transition probability model) but there is nothing odd that I can see. Think of it like a small river feeding a big lake behind a dam. The river flow stays constant but the lake grows hugely. In this case, the lake also “feeds itself” since any arrears case always has growing arrears amounts until it is cured. could not disagree more…case by case is ludicrous…as time will tell. George Osborne has decided to prop up the price of houses by effectively having the tax payer co-invest with new purchaser. The fundamental choice is whether to allow prices to adjust to make them ‘affordable’, or just shovel some more money supply at the market. Tory voters are generally leveraged investors in residential real estate. Then there are the nationalised banks with potential recaps. In Ireland the temporary sop to this constituency has been to ignore the question and do as little as possible. Many voters and many banks are stale longs of residential property. Those who would like to purchase a protected “family home” at a price they can afford are not a key constituency. Perhaps George has shown the way, maybe the state will keep prices artificially high by taking equity on its books? Commenter Carson makes a very good point above (11th comment from the top). One of the key points of the soon-to-be-announced PIA household budgeting guidelines is that they officially define distressed arrears (not paying a mortgage when household after tax income minus mortgage payment is below the referenced household budgeting guidelines) and strategic arrears (not paying a mortgage, PPR or BTL or both, when household after tax income minus mortgage payment is above the referenced household budgeting guidelines). This gives us an official, actually legally mandated!, definition of the cutoff point. With this in place, I repeat my evidence-based conjecture that strategic arrears are at or above 35% taking a weighted average of PPR and BTL mortgages. The actual percent should be estimable once the guidelines are finalized and released. It requires a simple calculation from household composition (budgeting characteristics) and after-tax income for arrears cases, on a random sample, by a bank or the Central Bank, or the ESRI working with provided bank data. I have a suspicion that at least some of the IMF staff seems to be on my side in this debate, reading the latest report, although they are too diplomatic to state it in those candid terms. Or perhaps I am over-interpreting their paper. Ft on saturday mentioned a very bullish JPM Cazenove note on UK housing that looked at 1 million potential Ftbs who did not buy since 08 due to credit rationing. And if just half bought in the next 3 years demand would rocket. And if my grandmother had wheels. Strategic arrears/defaulters is a small number but necessary spin for the banks and government to blow it out of all proportion (got to blame someone other than themselves). It’s on a par with saying people don’t commit suicide because of EU, government, economic and bank policies that have driven their businesses to losses and themselves to despair. By the way, has anyone been keeping an eye on what the Bank of Ireland has been doing vis. their tracker mortgages in the UK and attempting to hike the interest rates on them? The UK regulator seems to be washing their hands of it all? I think they are going to get away with it and then use it as a means to do the same in Ireland……. that will cause a few more defaults if they do…..
BoI’s UK trackers and Irish trackers are different beasts, contractually. The same thing is not going to happen the Irish trackers. No one gets repossessed in Ireland. Not even “professional” landlords. The repossession rate is negligible here. Those other countries on the graph do repossess. We don’t. If anyone was waiting for the time when our rather sorry peasant past was going to pay dividends – wait no more. Your ship has come in (sorry). The sacrifice of your ancestors who were booted out of their stone cottage in the arse-end of Connacht now allows you to retain your semi-detached house in Booterstown. And maybe even your BTLs too. See, everything works out in the end. as a strategic defaulter low level public servant which i am, it’s simple – pay the household and all the other lovely maintenance/increases/charges with reduced income and put off the ole morgage and maybe/hopefully try to pay morgage in a few months or emigrate. this is me being optimistic. What’s with lumping together,unless to muddy the issues BTL and PPR…judicial review of BTL…eh why ? Lets get this party started…. unleash the repo men on deadbeat BTL owners.Stock/collateral is getting run down,new entrants excluded from snagging a bargains…..why ??? What I think is happening is BTL owners are diverting cash flow to service mortgages on PPR….is that strategic default or common sense ? The rental growth rates are not correlated with the level of non payment in this sector,don’t have vacancy rates but again doubt they reflect the significant level of non payment. There will be a distribution of household after tax income minus mortgage payment and tendency to default. On one side of it ‘strategic defaults’ may be defined. On the other, ‘unnecessary determination to avoid default’ may be demonstrated. What advice will be given to, and what changes of behaviour might be expected from those in the latter group? How big that group is will largely depend on where the reference point is set. Per Ronan, BOIs tracker mortgages have a get out clause. Their Irish ones do not. @Colm McCarthy – the banks still have discretion (even under old revenue neutral price change rules on mortgage rates) to drive up SVR’s, but even if that occurred they may fare better because they have two common features 1) the older loans tend to have lower balances (trackers dominated from 03-08) and the more current ones were stressted over 6% at origination. As for the breakdown, what Seamus gave is about as good as it gets, any more granular than that & you’ll want to be chatting with blackstone/CB. @what goes Up – you are looking at balances of loans, so as they flow through it makes the >180days look like a moonshot, new flow and negative amortization are likely something to factor in. Something worth noting – in Greece mortgage arrears & restructures are c. 19-20% (Philip Boucher Hayes mentioned this today on Drivetime), in Ireland (with far lower unemployment and less financial stress) it’s c. 25%. With Gregory repeating his “evidence-based conjecture that strategic arrears are at or above 35%”, is there any chance that we could start a movement to “Bring back Debtors’ Prisons” ? @pedar the levels relative to other economies are off the charts. It concerns/impacts everyone in society this level of non payment,specifically amonst the BTL sector.If the bank/creditor in asset secured investement lending is prevented from perfecting on the collateral then,it’s unsecured…. Say so,move on……and good luck with the housing market. New owners of BTL with a lower bais,perhaps a bit more energy,not being in negative equity,may result in better product at better pricing.Most people would advocate BK laws mirrored on the UK’s or US,need level the playing field,or given borrower/creditor the North Korean option. Fla has something called a homestead exemption..
Housing bubbles are particularly hard to stop. Such bubbles have a lot of supporters while they are inflating. Irish banks made money from lending,estate agents made money from commissions on property transactions, as did solicitors and valuers.The Irish Times made enormous profits from their 60 page property supplements, and bought MyHome.ie to become the biggest property auctioneers in Ireland. They essentially became a property auctioneeer with a newspaper bolted on. In the long run the value of an asset must be linked to the income that can be generated from it,rent in the case of property,dividends in the case of shares. It is quite possible for individual assets to shoot up in price since residential areas can become more fashionable and companies can have very successful products. but in aggregate,shares and property prices are constrained by the growth rate of the economy. “unaffordable and ill-targeted as 84 per cent of mortgages [of principal homes] are not in arrears even though many of these are in negative equity”. So where does Gregory get his 35% for the non BTL sector? And it came to pass that the angel David appeared to Herod in 1998/1999/2000/2001/2002/2003/2004/2005/2006 and 2007 and told him”beware brother Herod a property disaster will happen,you must take all the children into the desert to protect them from this curse” but unfortunately the auctioneers and the Irish Times denied the angel David and told Herod ” beware of this devil David come party with us”. Guess what Herod did? GC has never said 35% for the non-BTL sector. That is something you wish he said. He has said 35% overall. He believes It may be > 50% among BTLs. What is the relative weighting of BTL and non BTL? – The “<90 days” category for March 2012 – June 2012 (Q2) figure was -100. – The “91-to-180 days” figure for June 2012 – September 2012 (Q3) was 1,050. – The “180-day+” figure for September 2012 – December 2012 (Q4) was 3,871. If there was mass strategic default, then you should see large numbers appear in “<90” in Q2, a majority of those to appear in Q3 and most to progress then to Q4. But it’s the inverse of that! No new arrivals in Q2, existing “<90” going further into arrears in Q3 and the largest number being “91-to-180” going bad in Q4. This shows that the banks are simply having their existing bad loans continue to deteriorate – and are failing to manage it. It’s the same when you look at the loan values. All the numbers point to existing customers simply going further and further behind – not new entrants joining them. You can say it’s tributaries adding to the existing mass in the lake – but that simply is an indictment of poor management. The fact that the banks have more people going into arrears on them that they are repossessing shows simply the banks don’t care – it has nothing to do with the Dunne judgement, that is a convenient sop to both sides, if there was an urgent need to deal with it, it would have been done. Both Brian Lenihan and Michael Noonan showed how quickly they could move when the need arose. The banks know they’re backstopped by the state – so why should they do their job and manage their loan book properly? They know they’ve got an implicit guarantee. Add to this, if they did their job properly it would be a political nightmare – so all the incentive lies with the banks simply allowing the loan book fester. If they had no guarantee, and they knew it was the difference between staying in business and going bust – they would have had the Dunne judgement lobbied into history lickety split and they would be foreclosing like there was no tomorrow. If there is strategic default going on, it’s simply because the banks have made it obvious that they no longer care. The vast majority of people are paying something on their mortgages. The Q-on-Q pattern you are looking for would only apply if all those in arrears were making absolutely no repayments so would move from 90 day to 180 day arrears in one quarter. That is not what the figures represent. Somebody making 75% of their payment will be 90 days in arrears after a year. It will take another year before they are 180 days in arrears. Suppose this represents all cases. Then the increase in the 180 day category would be more closely related to the increase in the 90 day category a whole year before. This does not represent all cases and people are falling into arrears at very different rates. Without inflow/outflow figures from the Financial Regulator (which would be very very useful) it is impossible to track the changes you are referring to. Thanks for that post. I am glad somebody who is actually in default spoke up. Table 3 in the cb report linked by Seamus Coffey shows a large number of arrears with positive equity. Repossessing these should result in no loss to the lender. Why have the banks not moved on these? If banks eventually start repos, they probably shouldn’t offer debt deals where positive equity exists (ie doesn’t make sense to write off debt ifyou can foreclose without loss). It would be helpful to get clarity on this. Although tossing people out on the street isn’t desired, I assume this has been ongoing in the private rental sector. Strangely the protection for these people’s homes doesn’t seem to feature in the debate. I’m not convinced much good will come from debt resolution plans. It will either be too expensive or the borrowers will ultimately default. This suggests that the arrears statistics refer to the amount in arrears rather than the time spent in default. Therefore, somebody who is more than 180 days in arrears could be paying all they but be in default for the last 3 years for all we know. If there are strategic defaulters, then surely they are more likely to be making no payments whatsoever, and accordingly data on how many people are making no payments whatsoever is required? It’s all about pretend and extend. Enabled by the ECB loans to Central Bank of Ireland guaranteed by the Government of Ireland. Propping up property values is the main game. Repossessions would expose the precarious state of the banks. And God forbid the foreclosure auctions would decimate property values. All out in the open for everyone to see. This is Ireland, can’t have that as long as we have taxpayers willing to continue the game and an ECB willing to extend credit. Not sure I’d agree with that analysis. The strategy in the case of a strategic defaulter is more than likely to fall into the category of a homeowner unable to meet the full repayment but is able to meet a portion of the full repayment (50%/40%/75% etc) providing the bank can strike a deal as to what constitutes a reasonable half way house between deal or default. The strategy will come to light following the cessation of the initial review of say an interest only period where both parties agree that as a long term solution interest only is not where its going to reside but a combination of a lower principal plus a fixed interest rate would probably have both parties relatively sanguine. The loss to the bank with such an arrangement would likely be significantly less than going the repossession route, in the knowledge that the full repayment is simply not going to happen as incomes don’t allow – this is a strategy i.e. make a deal which accomodates a lower income level (for a significant period of time) for the borrower and a loss for the bank but a loss which they have been compensated for by the citizens and a loss which both parties agree and hope will not grow from here. Bottom line: if there are strategic defaulters in the system (which there are) its highly unlikely that they are currently in the pay nothing category because as a strategy its a daft one as all that does is simply push the banks to the repossession road as a potential sale arising from a repossession is better than being in receipt of nada. Thats a stupid strategy on the borrowers behalf. They’re not all so stupid. The reason why were are not seeing hoards of repossessions is because the strategic defaulters are in fact being mislabled they are in fact strategic part payers looking for deals which they can live with. Propping up property prices has been the name of the game since the whole mess started. NAMA, the bailouts, the loading onto the National debt, the lack of a bankruptcy law, you name it. But Wil E Coyote now appears to have run out of road. You have highlighted the difficulties in using the arrears figures as a measure of current distress. Figures for neither A and B are available. @Seafoid know sure if update available,BTL and PPR here. I agree 100% – but if I were late at coming to the party and wishing to strategically default, then the thing to do would be to get to maximum arrears as quickly as possible, and the figures from Q2, Q3 and Q4 should show this. The key to strategically defaulting is to get to the 180-day+ category – these are the no hope cases that any normal bank would spend little to no time on management/recovery. These are the cases that will get any deal on arrears – anyone making, even minimal, payment in the other categories is simply either trying to keep their mortgage payment current or a really bad strategic defaulter. 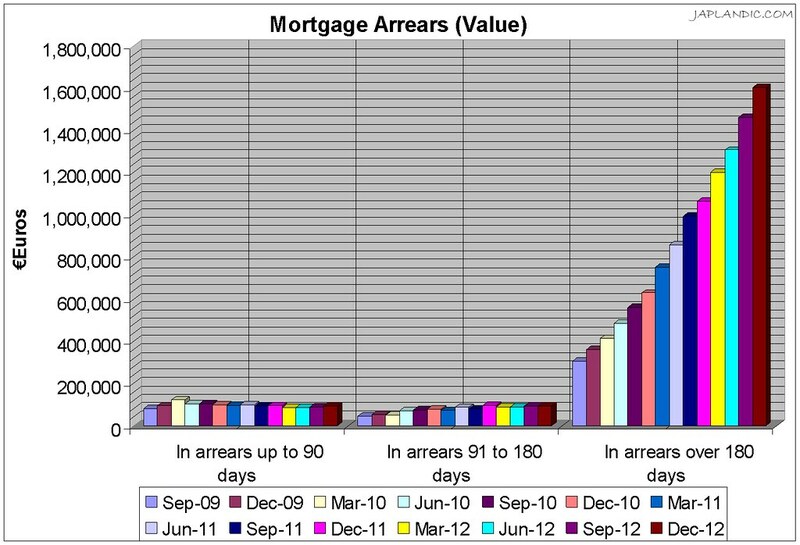 My argument is – if anyone wants to use the graph of “Late Stage Mortgage Arrears” to make the case for strategic default, then they should go and interrogate the numbers behind it – as, to me, they clearly show that borrowers are trying to keep current, but the banks continue to be poor at loan book management. Cynical as I as, even I am having trouble taking the Atlantic’s graph at face value. % of the total balance of what? The asset backed security? The mortgage book? Number of mortgages? Come on. And why is it so high in Ireland but so low elsewhere? Because the Paddies aren’t paying, or because the Paddy banks aren’t writing down loans in negative equity? The article hints at it, but my guess is that the principal reason for the divergence (if it is so severe) is down to the refusal of Irish bank management to own up to the problem of their own creation. They won’t write down loans, they won’t evict people, they won’t engage with either borrowers or the government. They’ve stuck their heads in sand and their sorrows in cocktails over the last four years. I firmly believe that there is no-one in command of this situation at any Irish bank, and that there is absolutely no strategy for dealing with the problem outside of whatever recommendations have been made by the Central Bank. Maybe whichever commentators around here work for BoI, AIB, or PTSB would like to take exception to that opinion? Propose that in fact, this dire outcome is solely the result of an orchestrated, regimented campaign by a mass of strategic defaulters, whose calculated machinations have frustrated even the most diligent efforts of those tippest of top men in the banks back rooms. Or whatever. Oh and it’s gonna get worse…..would appear that debt service coverage is non existent,perhaps the underwriting was a bit optimistic,or the borrower was too sanguine or greedy…. It looks like BTL @ 150K are around 20% of total mortgages – I saw 792K mortgages mentioned in a CB link above. So a 35% weighted average for BTL and non would be very sensitive to the assumption for non if it is 80% of total. And with 23% functional unemployment I wonder if 35% wouldn’t be a bit on the high side for strategic defaults for non BTL. You could have 100% BTL in SD but it wouldn’t change the numbers as much. Sickness or financial contagion are more or less the same. @Seafoid mobile,as grumpy would say I need a biro and back of envelope to verify the above ! Greg was referencing this answer….r non answer..the data is simply not available. Something is seriously wrong there. Even more so given that the “90+days” figure started at 18,727 in Q1! Either the failure rate in managing the “90+ days” category is astronomical or the banks are hiding arrears until they become extremely impaired and then just dumping them straight into the “> 180days” category. Again, if there is a case to be made from the arrears graph/numbers, it’s not that there is strategic default en masse happening, but simply that the management in the banks is atrocious. The DoF does not do “robust, structured, or in-depth analysis” of situations , to the best of my knowledge. Again I don’t see anything surprising. Consider the three categories of arrears. Assume that the inflow into each category is 5,000 per quarter. That is 5,000 accounts fall into early arrears, 5,000 early arrears cases move into the 90 day category and 5,000 move into the 180 day category each quarter. The number of arrears cases has gone by 20,000 and the number of cases in the 180+ days category has gone up by 20,000. It’s a bit of a simplification but reflects what is shown by the actual data. @Seamus Coffey and WGU — I have the same impression as Seamus regarding the dynamic growth in these categories – it looks intuitively correct and there is no particular anomaly to explain once you understand the rather complicated dynamics. The arrears growth is naturally concentrated heavily in the last category, in the absence of cure (which is the current situation). This effect is even much stronger for the arrears amounts graph since, unlike cases, arrears amounts grow in the last category even if there are no new entrants to that category. Due to negative amortization, the arrears amount growth is quite fast from this effect. None of the other categories have this effect. A fancy wedding may be the key to the setting up of a home in which many hopes are invested, which may be less likely to be given up strategically. Those ladies have their own way of looking at things. How many days in a quarter? What are the dividing lines between the categories? How do you get into 180 days+ (2 quarters plus) without first being in 90-180 days (1+ quarter) or <90 days (less than 1 quarter)? I believe that mortgages that are undergoing cure (on a plan) are not measured as in arrears, whatever the level of arrears. So cure is failing for large numbers and they are ending up in 180+ days arrears. That the cures are failing is evidence, I think, that the cures are not good enough. In the US, this is a measure that is closely watched to determine the health of bank mortgage books – allocate loan losses can be returned as profits if cures are successful and indicate future health. Even assuming 50% payments (i.e. capital and interest is being met 50% of the time by those in 90- and 90+) has everyone in the 180+ days by the end of the year. @seafoid thanks for the links,the should decouple BTL and PPR. “Modifications that significantly reduced monthly principal and interest payments consistently performed better than other modifications. Modifications with the greatest decrease in monthly payments consistently had the lowest re-default rates. Modifications that resulted in no change to the borrowers’ monthly payments generally have performed better than many modifications that reduced payments because these modifications tend to be offered to borrowers with adjustable rate mortgages who have not defaulted on their payments.”Pg’s 43 and 44. Very few tools in the kit/box rates are low….DEBT FORGIVENESS…yep only answer. I am having some terminology difficulties here. Perhaps I should use the tabloid style “can’t pay” / “won’t pay” monikers rather than the more malleable “strategic default”. Somebody who “won’t pay”, rather than “can’t pay”, is unlikely to be making any repayments. The stats don’t give us details of the numbers making no repayments. Also, I have used the term “default”. My understanding is that once you are behind you are in “default” on your obligations under your contract. The extra 20,000 new entrants should be spread across the categories with more stickiness in the first category. Seeing the numbers rise in the “<90 day” category should be an amber warning light accompanied by an annoying siren within the banks to indicate they need to aggressively manage their loan book. then a red warning light with klaxons blaring should be going off in the banks because their control systems have obviously started to fail – and more people are starting to become less likely to recover back to “180 days”. – both the sirens and the warning lights have exploded at this stage! The banks should simply shut up shop and go home – because they are no longer doing the very thing they are in business to do. No management of the loan book is happening. It becomes simpler for the banks to now bleat about strategic default, cultural anomalies, legal barriers et al – when the reality is they have failed to do their job. @WGU – yes you are correct that the dynamics of the numbers highlight the low cure rate for Irish mortgages in arrears. If the cure rate were higher the expected pattern would be different as you note. I don’t know that anecdote helps with the general debate, but what I see when helping clients in arrears deal with banks is fairly intuitive. Those with 24 months + arrears don’t have repayment capacity. The strategic defaulters (and in some cases I hand hold while people take that step, my client is informed of all implications and outcome but the choice is theirs) tend to dip in and out of different levels of arrears, part of playing the CCMA back against the bank is to engage, make a payment or two, disengage, come back again etc. The idea being to constantly get more cashflow but not be at risk of ‘not engaging’ which is why the IMF were saying part of any resolution should demand ‘material payments’ as a prerequisite. Strategic default isn’t a path dependent thing, and in one recent case (bank response due week after next) a client is almost 20 months under and will hopefully be back on track, the thing they needed the money fore is done now and they can now comply again, because the CCMA means you can’t take away trackers (proposed changes may remove this) a <2% loan is the best form of finance you could ever hope for. Obviously the intentional defaults are marginal, the debate isn’t about tarring all arrears or indicating that people who are behind are all scoundrels, but if anybody thinks that people are alternatively both ultra-moralistic in how they deal with banks (who lack moral high ground and thus give better justification in shafting), or are too thick to spot and exploit an opportunity then you’d better think again. The question is how much of this occurs, and how do you measure it. *disclosure: I have seen a lot of strategic defaulters who come to me as clients seeking mediation with banks, my bias is partly formed by that whereas people in debtor representation groups probably never come across these clients. Karl Deeter, thanks for the report from the trenches. Just to clarify, when you say people who are 24 months + arrears, do you mean these people are ~720 days past due, or do you mean they have simply been falling behind for 24 months? I note you later mention people who don’t pay an entire month’s bill, but is this the only way such enormous arrears are ammassed? You appear to have all the bases covered there. Would you care to enlighten us with some evidence-based quantification (either way)? I was one of the people who helped to make up the story (on behalf of govt and banks/BS) a while back that there were loads of ‘strategic defaulters’ in that arrears figure out there…. and aren’t they terrible people who are sucking the life blood out of the rest of ye’s etc (the aim was to put it in peoples’ minds that these people existed and they were in the same category as insurance fraudsters making your car insurance more expensive and it isn’t the govt’s/banks fault etc. )…… and we didn’t have any evidence at all when we made that up – we just wanted something to feed to the media when it was all looking a bit hairy and a lot of people couldn’t actually meet their mortgage payments (as they still can’t) because they simply have too much debt and not enough income…. and,er, it has very little to do with people playing the system or ‘strategic defaults’ at all. I spent a whole weekend making up that bollix. Please don’t tell me it’s actually true and that there are loads and loads of strategic defaulters out there!